These photos represent a few of the random things I discovered this week (5 to be exact, as I play along with Random 5 Friday at Nancy's A Rural Journal). 1. Gate. 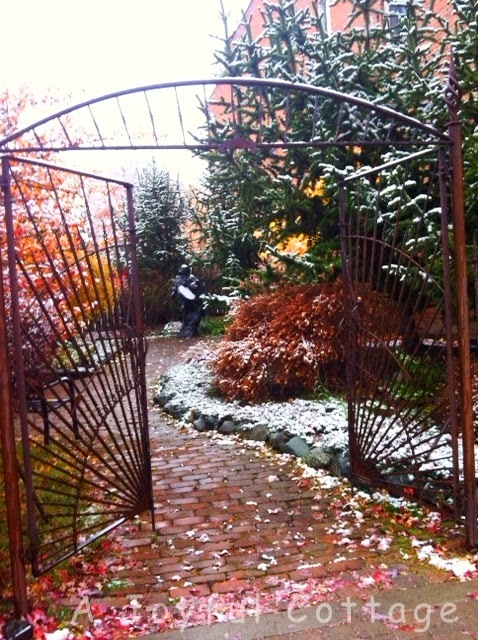 This gate is the entrance to a garden situated between two commercial brick buildings in our little town. Here it is with a very light covering of snow on Monday. 3. Tiny Cottage Kitchen. 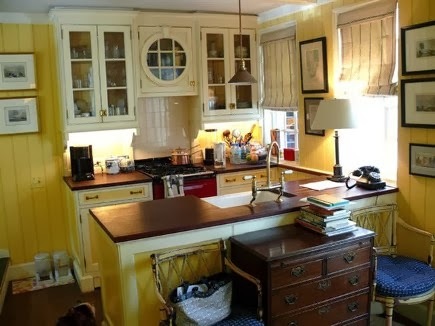 I'm crazy about this little kitchen I found while perusing the net. 4. 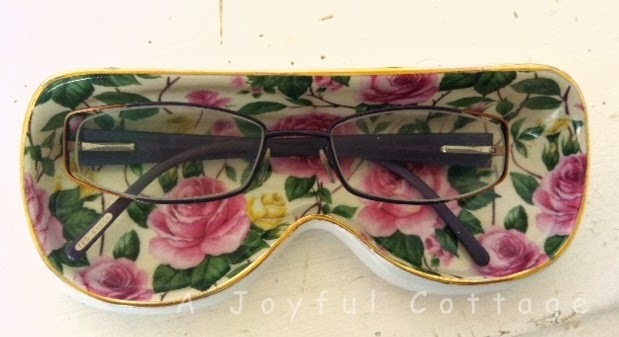 Eyeglass Dish Tray. I discovered this at the thrift store for $3. I couldn't resist it. Now I always know where to find my reading glasses. 5. An old cottage that appears abandoned. Another discovery in our little town. I believe it was a beauty at one time. Thank you for visiting. Hope your weekend is filled with wonderful things. These are great Nancy! Love your eyeglass holder -- awesome find! I have to say my heart skipped a beat when I saw it, Nancy. Anything with pink roses gets my attention. The eyeglass holder is a great find. And that kitchen...Perfect. The eyeglass holder and the little kitchen kind of belong together, don't you think? That eye glass holder is magnificent. I want one. And a thrift store find at that?!! Lucky you. That gate entrance is gorgeous. Thank you very much for taking the time to visit and comment. Much appreciated. That garden gate would pull me right in to take a look . . . as would the abandoned house. Charming indeed! I would really love to go inside that house, Lynne. It's always dark inside, so I'm assuming it's abandoned. Someone does mow the lawn, though. Hmmmm. For just a few seconds we saw that it was a double rainbow, but we couldn't capture it. For some reason I couldn't get your email address link to work. Just wanted you to know that you've been featured on my weekly Welcome Wagon Friday post. You should be receiving visitors shortly. Welcome to our neighborhood! Brenda, this is so funny. I just visited your blog and saw you had featured my fall vignette. Not knowing, I was very surprised and pleased. I left you a comment thanking you and next saw your comment here. Thanks so much! You're a dear. A beautiful rainbow, and that eyeglass dish is a great idea, I might be able to find my glasses if I had a special place to put them! Love the eyeglass dish. Unfortunately I have to wear my glasses all the time except when I sleep. But, it's a great thought anyway. That abandoned cottage...they always make me sad. To think that one time they housed a family...more than likely kids grew up in them and now they are no longer loved. I love that little kitchen, but cannot imagine all my stuff fitting in there. Maybe I should get rid of more stuff! That abandoned cottage is lovely ... imagine the stories it could tell. I always try to imagine how old houses like that looked when they were brand new, who might have lived there, what they were like. And, of course, I always wish I could buy them and restore them to their original glory. And it was sunny and warm today. We've had quite a fall so far. More snow is expected next week. Wow, that rainbow is awesome! I don't think I've ever seen a complete one like that. 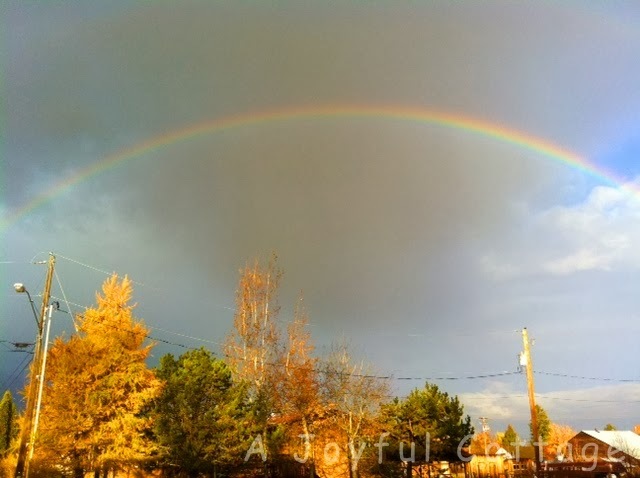 Rainbows always fill me with awe and gratitude. Haha. You're lucky you don't have to wear prescription glasses like I do. A wonderful post, and will be stopping by here often to visit. Is this joyful cottage the place that you moved to when you moved?? I am visiting via Cozy Little House. I have to say that I am in love your header photo. My daughter just moved to town and I am working on her little garden and looking at your photo gave me an idea for one troublesome spot. My pleasure. It is a gorgeous garden in total. I will have to do a post one day and show more photos. A very, very special place. My husband and I were married inside on Valentine's Day 2010. Blessings to you, and thanks for visiting. That iron gate is marvelous! And there is definitely something about that kitchen that steals my heart. So, a little bit of snow there? But nothing like what you were getting in winters before the move, I hope! Just a little bit of snow, Dewena. It snowed early morning and was gone by 9 AM. We hear the most snow they get at a time here is about 1 foot. Much more tolerable than the snowfalls we received in Colorado. 4 feet in April, and another 4 feet in May. these are awesome! I love the eyeglass holder. I've resorted to leaving my case open on my nightstand, so that I always know where to find them; but wouldn't it be grand to happen upon such a nice find as you have! I really enjoyed your five things. That kitchen is super cute and the rainbow, divine! I am always reminded of God's promise when I see one too. Your photographs of the huge gate and the abandoned cottage are very pretty. And I love the eyeglass dish, how perfect is that! I came over from cozy little house. What lovely photos! You have an artistic eye and skill with your camera. Thanks so much for coming to meet me at Harvest Lane Cottage. Have a terrific week! Oh, Laura, you're so kind. Thank you. Those little abandoned cottages - it makes me sad to see them empty - and it makes me want to read their story like a good book! Beautiful images! No snow here yet - but I CANNOT wait! WOW! I love the Eyeglass Dish!